More Heat...Watching The Bay Of Campeche. Bad news for Sacramento and Weed...about 250 people from these communities are being evacuated as a precautionary measure due to the Little Lewis Fire. From Eyewitness News4 KOB In Albuquerque, NM. Lightning has started the Little Lewis Fire 8 miles south of Mayhill. 150 acres have burned and the fire is 0% contained. 15-30 homes are threatened as well as the Methodist Church Campground. Slurry drops have slowed but not stopped the spread of the fire. New Fire In Lincoln County, NM. The Donaldson Fire has consumed some 15,000 acres as of early this evening. It is burning south of Hondo, and south of US Hwy 70. The fire is 0% contained and smoke from the fire can be seen in the skies just to the northwest and north of Carlsbad, NM. Lightning strikes started two new fires in Lincoln County yesterday afternoon on the Donaldson and Skeen Ranches. The fires have burned more than 600 acres, and are 0% contained as of 11:30 AM MDT this morning. For more info on these fires and others currently burning in New Mexico please visit this link. 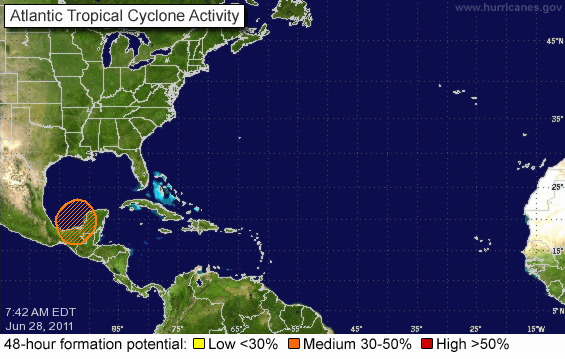 Tropical Outlook Courtesy Of The NHC. IR Satellite Image At 7:15 AM MDT Today. 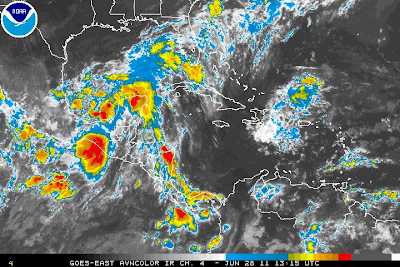 A tropical wave moving off of the Yucatan Peninsula, and into the Bay of Campeche today, has a 50% chance of becoming a Tropical Storm withing 48 hours, according to this mornings outlook from the National Hurricane Center (NHC). Valid At 3 PM MDT Wed Jun 29, 2011. FSU Hurricane Forecast Model Output. 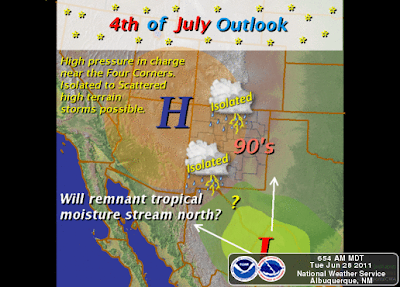 Outlook Is Courtesy Of The Albuquerque NWS Office. All eyes will be on the Bay of Campeche today as a tropical wave emerges from the Yucatan Peninsula. There is a fairly decent chance (50%) that this easterly wave will develop into a Tropical Storm within the next 48 hours. 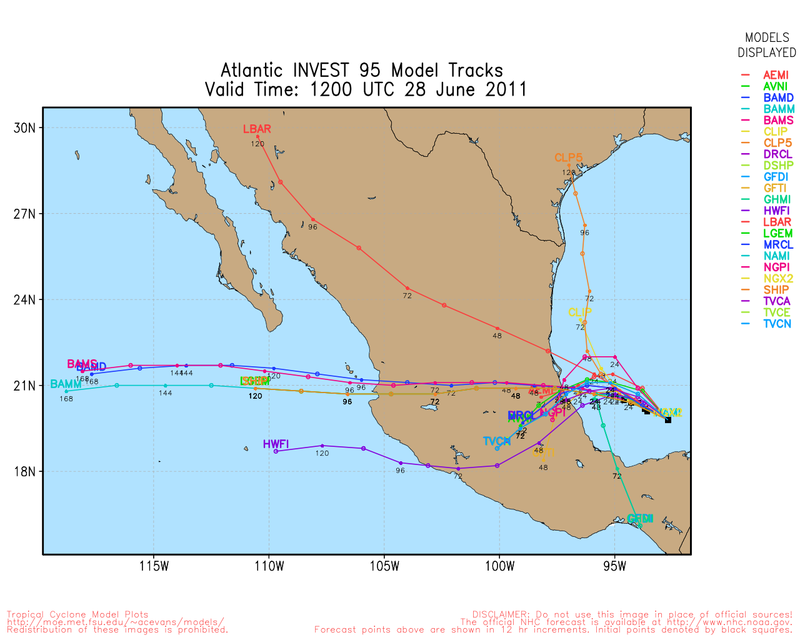 The models generally agree that this tropical system will then crawl slowly northward along the eastern Mexican Coastline this week. If this storm can remain far enough off shore it will have a better chance of strengthening. 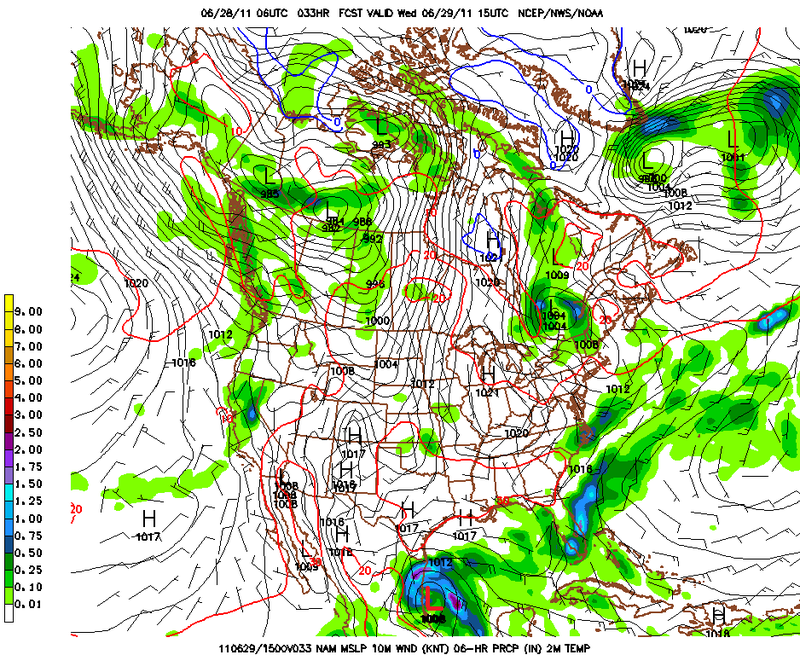 Should this storm become strong enough it could be the seasons first named storm (Arlene). summer monsoon, as remnant moisture is potentially drawn northward into Mexico and eventually New Mexico. High temperatures yesterday once again exceed the century mark across SE NM and nearby areas. Highs ranged from 109 at the Carlsbad Airport, 109 at the Paduca Raws near the WIPP Site, 109 at the Jal Climate Station, 108 here at my home, 108 at the Carlsbad Climate Station, 107 at the Caprock Raws, 106 at the Artesia Climate Station, and 104 at the Roswell, Artesia, and Hobbs Airports. A weak cold front moved into SE NM late yesterday afternoon, and this feature provided just enough lift and moisture to fire up a few scattered t-storms. A cluster of t-storms formed just east and southeast or Roswell and outflow winds from these storms produced a wind gust to 60 mph at the Roswell Airport along with lots of blowing dust. A personal weather station located in Clovis (CW3200) measured .54" of rainfall from these storms yesterday. Cannon AFB Near Clovis .27"
Cloudcroft - Dry Canyon .18"
As of 8:30 AM this morning the Las Conchas Fire has burned 60,470 acres. The fire is 0% contained. The Las Conchas fire near Los Alamos, Jemez Springs, and Santa Fe New Mexico. These shots were taken from the west and south. The fire started from a spark and grew to over 45,000 acres in less than 24 hours."